With the latest Alpha 77, Sony has introduced SLT version II, the new upgraded ‘Translucent’ mirror. This is in an attempt to reduce the ghosting effects created by having an angled mirror between the lens and sensor, the image forming rays passing through a semi-silvered (pellicle) surface, through a thickness of polymer film, and then to the sensor. Having tried it out (update, September 8th) we can confirm that it works. You honestly would never know there was anything between the lens and the sensor. But Sony, like all makers, has continued to think in terms of SLR design and the old world of film negatives and slides, where the image always had to be a certain way up on the film, or it would end up being printed and projected reversed left to right. In the past a simple reflex mirror for a TLR viewing screen – like the Rolleiflex – did a useful job of turning an inverted image the right way up for viewing. On film at the back of the camera, the image was both inverted and left-to-right. But that did not matter, as the film was viewed through its reverse (back) side to see or print the image. Somehow, this old design has been continued to new cameras – but today we use digital sensors. The upside-down or left-to-rightness of the image does not matter as we view the image on a screen or using an EVF. No matter how the image ends up on the sensor, it can always be the right way up and the right way round for us to view. So, Sony, when you make you that full-frame Alpha 99 camera change the entire approach. Position the SLT mirror so it reflects the image sideways, upways or downways! And put the SENSOR where it receives the image from the REFLECTED lightpath. Make the mirror reflect 70% of the light and transmit 30%, instead of the other way round. There will be no double imaging, no flare patches, no ghosting and not even an extra substrate or layer for the image forming rays to pass through, if the sensor receives the reflected image not the transmitted one. The AF sensor, in the meantime, can be positioned in direct line to the lens where the imaging sensor has been in the past, measuring the image through the SLT mirror. This arrangement (©David Kilpatrick, Friday morning, August 26th 2011, scrambled eggs with smoked salmon for breakfast) will in a single stroke remove all the complaints about image degradation as the mirror will provide a perfect image. But – would it? Slight lack of plane perfection in the SLT mirror used to transmit the image-forming light, and reflect the AF-measuring light, does not have much effect on the image. Anything less than an optically perfect mirror would fail to create a quality image. It would be like sticking a cheap filter on your lens, or worse. And of course it would never fit into a normally shaped camera body with a full frame sensor and shutter. Ah – the AF sensor, unlike the imaging sensor, does not need cleaning to remove dust spots. So the mirror would not have to be movable. Actually, it would not have to be a pellicle mirror. It could be a lovely big lump of pure glass prism moulded straight on to the AF module itself, even including the condensor-collimator lenses of the AF system. It could be solid glass all the way from mirror surface to AF receptor, and the 45° front face could be to the same optical perfection as the best Sony G lens. Or even the best Carl Zeiss lens. Hell, it could be a Carl Zeiss prism and then the camera could have the CZ logo! Diagram above: light blue = solid glass optical prism with 45 degree semisilvered front face; the two white indents at the right hand side indicate AF modules set into the prism rear face. Pink = shutter (optional, ideal system would have electronic shutter only). Dark blue = sensor. Green = top mounted waist level viewing screen, also articulated. A secondary eye-level EVF would or could be used. Design ©DK with a bit of nicked Sony lens cross-section. Design? Rollei 6000 all the way! A professional, Hasselbox-shaped thingy to cradle in your hand. With a rotating 24 x 36mm sensor too, so that you change the format aspect by pressing a button not maneouvring the camera body. A 3 inch square OLED on the top like a giant waist-level finder, showing the image vertically or horizontally as you turn the sensor. A waist-level viewing hood for a giant magnified view. Maybe even a monster top prism for the biggest EVF you could imagine! Mor realistically, an eye-level EVF in addition to a top plate OLED or LCD panel designed to be hinged up/rotated/twisted – rather like the LCD of the Sony Cyber-Shot DCS R-1, one of the best ever ‘waist level finder’ options fitted to a digital camera to date. In fact something like s giant updated R-1 full framer might do well. As for the image sensor, that could be in the well of the camera (mirror aiming down) but maybe having it in the top of the camera, below the viewing screen (mirror facing up) would help gravity reduce the dust issue. The point is – it does not matter where the image sensor is placed, it does not have be where the film once was. It does not matter whether the image reaching it is inverted or reflected, as unlike film it does not have an emulsion side or a film-base side, the electronic viewfinder is independent of the orientation of the optical image. Future ‘SLT’ EVF cameras – especially a future Alpha 900 replacement – do not need even to resemble today’s DSLRs and can be made better by abandoning ideas fixed in designers’ minds since the era of film cameras. Technical note: angled partial mirrors, whether prism surface or semi silvered, create polarisation effects, colour shifts and a varying efficiency of reflection depending on the angle of incidence of the ray. This is one barrier to the use of pellicle mirror design for a full-frame model, as the back focus or telecentricity of lenses relative to the format would mean a greater range of incident angles across the mirror surface. Sony appears to have overcome any such problems in the existing APS-C SLT design, and the slightly forward tilt of the mirror (not a true 45°) helps in this respect. I propose the above design in full awareness of related optical and technical issues. I’m not assuming they do not exist – they would need solving. It makes total sense to reflect most of the light off a first surface letting any ghosting go through to the AF sensors. Given people can only find it at select locations it will probably be gone for good. In addition this setup allows the much more stable camcorder camera style. It is more stable to have the camera resting on the base of the palm. It is more comfortable as well. Good creative thinking David! There’s probably quite a few different tacks that could be taken, how about for example leaving the sensor in the back but angling the pellicle at 75 degrees instead of 45 and placing the AF sensor assembly at appropriate angle right behind or just above the top edge of the lens mount? Or angle the pellicle at 75 degrees and put the sensor array behind the top edge of the lens mount, with an IR and/or anti-alias filter that can slide out for cleaning or can be replaced with an IR-transparent and/or non-aliasing filter when so desired? And/or combine with a next-gen approach to the pellicle itself: use a liquid crystal based switchable mirror to oscillate rapidly between 90% transmittance and 90% reflectance while the shutter release is not pressed fully, then when the release is pressed all the way freeze the “LCPellicle” at 90% transmittance for the duration of the shutter cycle (eg with shutter speeds faster than 1/50 sec or so to ensure that moving subjects in the viewfinder do not stutter noticeably to the eye). For longer exposures the transmittance could be very briefly interrupted 50 times per sec with 1/300 sec high reflectance pulses to keep the AF module in the loop (if so desired). This would significantly reduce the current 1/3rd stop loss of light to the sensor, and it could also be manipulated electronically to act as an internal “variable ND filter” for long exposures. Switchable mirrors already exist, see e.g. the website of Kent Optronics. Switchable mirrors are more than interesting – they have made great progress in digital projection. There are so many technical possibilities. Even the two layers of cover glass/filter present on the typical sensor assembly provide a theoretical rangefinder base when observed by two focused receptors viewing the reflections from different angles (given control of relective qualities). Or the ideal solution – a perfect 100% optical viewfinder camera like the A900, with a fixed 45° mirror that also acts as a shutter by becoming transparent. Totally silent and seals in the sensor from dust and no moving parts. Similarly, inside a lens there’s no need for a physical aperture. A thin plane glass element fitted with an LCD variable aperture (you could even change the shaope for funky bokeh like stars and rotate the entire element to act as a polarizer, which would be its major problem). Or two elements, one flexible like a semi-hard contact lens with a minutely convex surface, sandwiching an opaque liquid under slight pressure – move them apart a few microns and the liquid floods the entire cell (shutter closed), move them together and suddenly an aperture opens as the convex surface touches the plane surface – closer together and the aperture widens. Not quite as no-moving-parts as an LCD aperture. Almost anything @photoclubalpha.com will reach us but [email protected] is the normal one! I would like to send a sketch in pdf to you but I am not able to find an e-mail address. Could you please help me? This is page 6 of the Alpha 55 review from last December. You will see examples of the precise ghosting and flare effects shown. But it takes extreme testing to produce them and I use my A55 daily with no problems under any lighting. I have to comment that this page also includes a 100% view of a 25 megapixel export (larger than the A77 file) from an A55 raw. Considering the awful quality of dPreview’s A77 samples, I would find it hard to justify changing from the A55. But then again, I bet with decent raw conversion and reasonable care in taking the sample photographs I could show the A77 to be far better than dPreview’s disastrous in-camera JPEG sample gallery. A lot of comments! Jiri – agreed – remove the shutter and the SSS moving sensor, use pixel based stabilisation, and some kind of sealed system would be great. However, I think that a 45° internal prism surface gives nearly total reflection – it’s not the same as going the ‘other way’ from air to glass. Glass to air creates such a perfect mirror at 45° that there might not be enough light getting to the AF module. I’m not a physicist either but I do have some prisms and I can see the effect clearly enough! I also know that mirror coating roof prisms improves their efficiency (as in binoculars, and SLRs) – therefore, some light must be transmitted. But I would not be surprised if it’s under 5%. And Youpii – yes, if that can be made to work. Remember that CDAF does actually work on the NEX, it’s only the lens AF design which has limited that possibility on Alpha. It would be even better to remove the mirror entirely. The phase-detect AF sensor can be integrated in the main sensor by sacrificing some pixels. I think Fuji has done that on P&S cameras. Just joined up with this forum specifically to ask you about the ghosting effect. I had not noticed any ghosting effect with anything taken with my A55 (that I eventually returned) and as such have no idea what this issue looks like. A quick google search brings up discussions, but the photos that people present as evidence of this ghosting are, for my admittedly inexperienced eyes, not visible. Could you possibly provide some concrete and easy to distinguish samples of this occurrence? I’ve already pre-ordered the A77 and am wondering if, based on this ghosting discussion, I should cancel that pre-order and see how the ship sails. There may be one other impediment: The SSS system will impart some amount of uncorrectable rotational motion because it is no longer on the lens axis. However, you may be right that it is going to be replaced electronically. I believe that pixel pitch will continue to shrink until it is below the ability of the best optics to resolve it. When that happens, pixel shift becomes a no-brainer. I have a Sony A200 right now,but its too heave to take.I want to buy a NEX-7 these days,but friend say NEX has few lens. An amendment to my first entry: I meant to replace the light blue and WHITE parts, of course. A small addition to my proposal: In the proposed arrangement even the reflecting diagonal surface would be protected aggainst any dust. So the only surface to clean woud be the vertical entry surface of the prism, easily accesible when the lens is removed. Excuse me if I am wrong in my thinking as I am no physicist: would it not be possible just to flip the scheme over (to replace mutually the light blue and parts in the drawing)? That would mean to attach the sensor directly (sealed against any dust) to the top of the prism. The stabilisation would have to be in the lenses then, probably. Wally, I was lucky enough to snag an ex-professional studio Hasselblad 500 kit with Phase One P20+ and 80mm CF Planar recently for little more than the A77 with 16-50mm will be. It’s ‘only’ 16 megapixels but using it has been a real eye-opener. Whether it is the quality of the lens, the size of the pixels, the lack of an AA filter or just a combination of everything the results are amazing – from raw, they can be exported at 150% or so and still look as sharp as the best Alpha 900 file – 70-100MB final images. It’s an old (!) 2005 4 x 4cm sensor. One of the better UK dealers had a Mamiya ZD – 80mm, AF, 22 megapixel sensor for not much more recently. It is slowly getting possible to find affordable used MF kit. If anyone gets a chance, I do advise going for it. I now have a camera which is impossible to hold and slow to use but it’s providing a benchmark against which I can judge all other digital images. I’m still waiting for a true 6×6 sensor (no need to rotate for vertical or horizontel). But given the price of the current medium format sensors, I expect it will be a long time before I can afford one. I am intrigue by the new Alpha 77 and 65 but mostly due to the EVF. I do not expect any lens I have will make use of the APS-C 24 MP sensor. With a perfect lens the image will be diffraction limited somewhere between f8 and f11, and few lenses have the resolution even at their optimum f-stops to be better than the sensor. This is another very interesting and thought provoking article. The main “problems” I have experienced with my A55 have been purple fringing in high contrast areas. I have also experienced dust not only on the sensor but also on the mirror. I had to resort to manually wiping the mirror with a sensor cleaning pen to get the dust off – against Sony advice I know but it worked fine. I still love then camera and will probably upgrade to one of these new Sony’s in a year or so once the price settles down. Of course it would not have to be solid glass, that’s just a possibility. OneGuyKS – there would have been no ghosting or reflection problem to solve. Let’s hope the A77 pellicle does prove better. All my design adds to the mix is one concept which, unless already patented, now can’t be patented. By presenting it here I put it in the public domain and beyond the reach of patent, in theory. LEdgars – if more than one sensor was used, AF could be achieved by various other methods. Three-sensor designs are used in high end TV/video. SteveGJ – if you could clean the focusing screen of a conventional SLR, you could clean the sensor of a reflex design like this. If perfection was the object, the entire darkchamber could be a prism, glass sealed to the sensor cover assembly, to the AF module. Would be excessively heavy in full frame, OK in APS-C and very practical in smaller sensor formats. I will say one thing for Sony’s current design, I have never had any dust spots at all on the A55. There has been no need for cleaning as the pellicle mirror seems to protect the sensor. My solid prism idea could be used with the existing design and would eliminate all dust issues, but only if there was no longer a mechanical shutter. I believe the next phase in DSLR development will be the elimination of the mechanical shutter. The future almost certainly lies in designs with no mirrors and no separate PD AF modules anyway. It’s a pity in a way (but not entirely!) that 3D is rumoured to have failed commercially because two-sensor 3D cameras with a twin lens can do phase-detect plus contrast detect AF combined, directly from the imaging sensor. I’m not wholly convinced by this design. One problem I forsee is it’s going to be a pig to clean the sensor. You will, of course, have the reflection available in the loupe, but you’ll still have to have the mental agility to deal with the mismatch between your hand actions and where the sensor cleaner will be. I forsee the potential for a lot of accidents with a delicately coated mirror surface very close to hand. Of course the addition of several cubic centimetres of solid glass to the design is going to add significantly to the “heft” of the camera. An interesting bit of lateral (or should that be reflective) thinking on the subject, but I rather think the shortcomings will outweigh the advantages. The ultimate aim surely will be to remove as many extraneous optical barriers as possible in the optical path. There is a similar solution. I remember some half a year ago was rumored three-CCD or (three-CMOS) sensor camera from Sony. 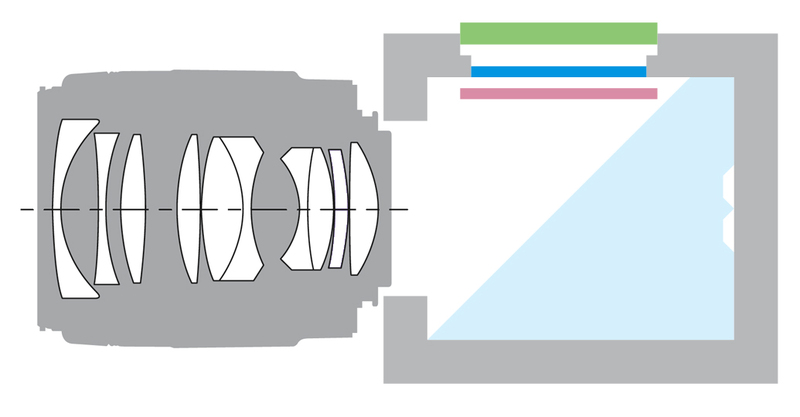 In such camera light is split by a trichroic prism assembly, which directs the appropriate wavelength ranges of light to their respective CCDs. Then it is possible to increase each pixel size area 3 times for crazy high ISO, DR and color performance. The remaining question is where to put AF sensor, but with such a large senels half pixel PD AF sensor could become reality. Such camera already was made 15 years ago (Minolta RD175). Sony claimed they have solved the ghosting issue with the new coating. If that is so, what does your design add to the mix? Enjoyed your thought provoking rant. I do wonder if it has any effect on inbuilt stabilisation? I don’t know much about how parts of a camera operate but it seems to me it wouldn’t be able to compensate for camera shake unless it was adjacent to the lens. Stabilisation is not connected to the mirror/direct/SLT viewing method. But live view IS does work better on the NEX with OSS lemses. Sony is moving towards eletronic (pixel shifting) IS anyway. Of course, the makers have also forgotten the use of external AF modules – the electronic equivalent of a two-window rangefinder. There’s no special reason why a camera like the NEX should not have an external-window AF system for fast snapshot AF not using sensor contrast detect. But it’s old technology that has slipped under the rada. Thought provoking article, David. Truly, thinking outside the box. I’m not a physicist (anymore – I was 40 years ago) so I’m going to have to think more on the detail of this but your idea about thinking beyond the old film script seems to me to be very interesting indeed. I have to say I still do not understand the benefit of SLT although from what I’ve read it seems to be all about AF and the ability to use phase rather than contrast detection, as in the NEX. Personally, I think the NEX is the way forward because any object, such as a translucent mirror, in the way of the light path will inevitably cause some degradation of image. It strikes me as very odd that, in an age of increasing miniaturisation, SLR cameras and lenses have got bigger and heavier – compare the A900 ore even A77 with the pre AF Minolta SLRs and I think that people will increasingly want small enthusiast cameras. Now there is an EVF on the N7 it will greatly enhance the ability to focus manually, with or without MF assist, which will permit manufacturers to come up with high quality miniature lenses and I can’t wait for the likes of Cosina Voigtlander to start providing these in E-mounts. I suspect this all has the potential to relegate Leica’s camera division to the Ferrari set but that shouldn’t worry them to much with the rise of a new super-wealthy class in the BRIC countries.